Looking for vintage style storage furniture? 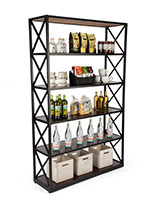 This French industrial shelving features a stylish rustic look that goes with residential and commercial environments. These boho shelves are made of real wood and steel for a sturdy construction that will last for years. 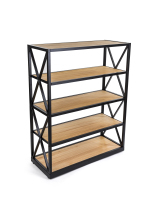 Each commercial-grade French industrial shelving unit has strong X shaped supports on the sides for extra stability. The bohemian style furniture are excellent for trendy retail stores and restaurants that want to draw in customers with chic décor. French industrial shelving creates attractive commercial storage fixtures as well as vintage style home furnishings. Our floor standing rustic furniture is available in a variety of shapes and sizes. 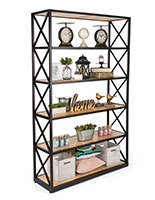 This wood and steel French industrial shelving includes 26" high console shelves that are great for featuring merchandise. 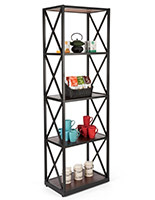 These feature three ledges that easily display clothing, handbags, coffee, books, and small accessories. 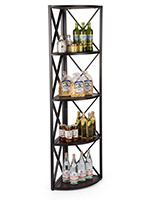 Our tall bohemian industrial shelving has five or six shelves that can hold a large quantity of merchandise in one place. Maximize your retail display with these large vintage fixtures. 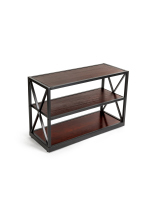 Our corner shelves feature the same strong X-sided fabrication with rounded ledges. These vintage chic bookshelves complement rustic pipeline fixtures for a classic and appealing look. Want to match the room? Our rustic industrial shelving is offered with light natural wood ledges or dark brown shelves. Choose the type of stain that's best for matching retail store, coffee shop, or living room. 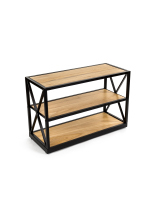 The black steel frame contrasts with these colors to make the authentic pine wood stand out. These natural wooden ledges are excellent for featuring artwork, glassware, kitchen utensils, statuettes, and collectibles. Give your display a classic twist with bohemian style displays. 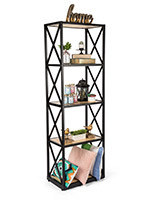 What else makes this rustic shelving great for featuring books, curios, and merchandise? Each rack features adjustable foot levelers for stability on uneven flooring. This is great for displaying items that require a level surface. 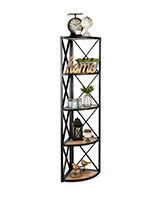 The shelves also have open backs that keep walls and their décor fully visible. THere's no worry about hiding your new paint job with these vintage shelving units. 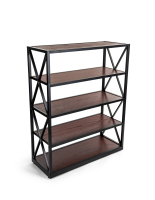 Create a warm atmosphere with these rustic bookshelves with sturdy steel frames.